What's the difference between a CAT A and CAT B Fit-out? There is no standard definition for a category A fit out and it can vary from developer to developer. Most often, it describes the level of fit out provided by the developer to the landlord. You quite often find that the developer will make a contribution to the tenant for the carpets, floor boxes and grommets, which are then installed as part of the tenant?s category B fit-out, rather than installing them during the category A works, as they are subject to damage and may not complement the tenant?s colour scheme. This is the type of fit out that most people are more familiar with. A Category B fit out is conducted on a space where the external walls and basic flooring, ceilings, M&E services and shared toilets and lifts have been installed. It?s like moving into a house and then installing your choice of flooring, lighting and decoration to make it your own personal space. At Trevor Blake we carry out both Cat A fit-outs and Cat B fit-outs. Where a company is required to bring an office back to its Cat A state for hand over to the landlord, we provide a dilapidations service which typically involves the strip out of partitioning, flooring, decorating and furniture. Most of our work is within London, Surrey and Sussex although we do cover the South East. 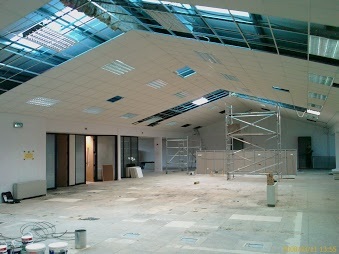 Please take a look at a recent work which includes this Cat A and Cat B fit-out. Being based outside of London, we are able to offer extremely competitive quotes. Please call us on 01293 775 509 to arrange a no obligation, free consultation.